Get $25 off per axle with the above coupon – includes a free brake inspection! 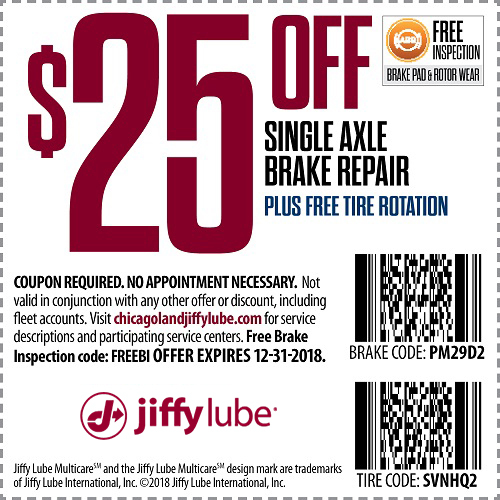 Select Chicagoland Jiffy Lubes are now offering new brakes services, free brake inspections, new brake pads, rotors, tune-ups, and suspension work. Jiffy Lube offers ASE certified technicians at these locations to provide you with fast, competitively priced maintenance services beyond fluid changes. Think Jiffy Lube for tune-ups, brakes and more. Contact the listed brakes stores for more information. Select locations offer tune ups and other maintenance services. Did you know some locations even offer new tires? Not all Jiffy Lube locations offer all services or participate in all promotional offers. Please call ahead to ensure your Jiffy Lube service center location offers the service and is participating in the promotional offer. 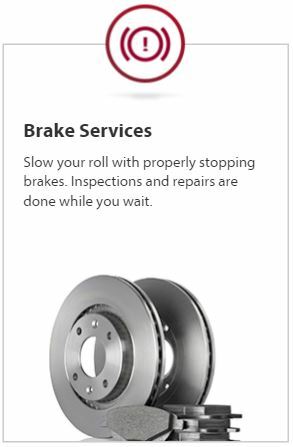 From drum brakes to disc brakes, calipers and rotors, to shoes and pads, the highly trained technicians at Jiffy Lube(r) know your brake system and can perform brake inspections and brake pad replacements on almost every make and model. This includes models equipped with ABS, otherwise known as an Anti-Lock Braking System. So you can drive with confidence and Leave Worry Behind®. Please note: Call ahead to ensure the service is available. Still – no appointment necessary!